Republicans have suffered a death in their family. Sixteen established party candidates have slowly ended or suspended their presidential candidacies in the 2016 presidential election, and party leaders are trying to divine whether Donald Trump’s unthinkable ascent actually spells the end of their party as we have known it since the late 1960s. Journalists have indulgently chronicled the tortured reactions of Republican diehards, replaying their vows to support the nominee and their earlier assurances that their party would eventually come to its senses. However, as with any death, this one appears irreversible. Each election cycle for the past two decades, Republicans have carefully embarked on the tightrope walk in which they court the support of the moderate suburban business bourgeoisie with libertarian economic stances, all while wooing largely white working class voters with wedge social issues related to immigration, homosexuality, and religion. This election cycle marks a (likely terminal) heart attack. To white working class constituents who are exhausted by career politicians, the Republican Party simply cannot credibly sell itself as Washington outsiders after an obstruction-ridden four years of Congressional control, and holding executive power for the eight years that preceded an economic catastrophe. To moderates who are turned off by the party’s culture wars, the Republican Party is torn about whether to acknowledge that they are now on the wrong side of wedge issues that previously distracted white working class constituents from their economic plight. Still feeling the after-effects of the 8-year-old financial crisis and the 40-year collapse of US manufacturing, white working class people have recognized that neither Democrats nor Republicans have done much to ameliorate their economic situation. And cultural conservatives have recognized that Republicans are only paying lip service to social causes that are slowly being invalidated by courts, or are politically untenable. We are now about halfway through the Five Stages of Grief, as described by Elisabeth Kübler-Ross in her 1969 book, On Death and Dying. The initial reaction to a loved one’s death is to deny the reality of the circumstances. This was present throughout the Presidential primary season, when Republican candidates, advisors, and donors assured themselves (and the world) that Donald Trump’s popularity was ephemeral. All the theories emerged after Trump’s second place finish in Iowa: The polls’ respondents were not likely voters. Trump’s supporters were not dedicated enough to endure the caucusing process. Trump lost nearly all last-minute deciders in a race with record turnout. As Trump won victories in New Hampshire and beyond, new theories emerged: Trump will be bitten by the things he has said and done in the past, and the public will clamor for honesty. Trump will not accrue a majority of delegates and party elites could stage a coup at the convention in Cleveland. This denial lasted longer for some (i.e. Ted Cruz and John Kasich) than others (e.g. Marco Rubio and Jeb Bush). However, denial is a normal way to cope with overwhelming emotions and carry ourselves through the initial pain of loss. Eventually, the pain reemerges from behind the illusions of denial. Republicans were not ready for the reality. This anger has been expressed by a number of GOP luminaries: John McCain, Lindsey Graham, Jeb Bush, Mitt Romney, and Karl Rove. Anger is directed at Trump, but also at his white working class supporters. They have been called “non-Christian”, “vicious, selfish” voters subject to “incomprehensible malice” who “deserve to die”. Why haven’t Trump’s supporters come to their senses? Why haven’t they been turned off by Trump’s record? Why don’t they realize that he is not really a Conservative? Deep down, party leaders know that his supporters are not really Conservatives either. Conservatism, as they have come to understand it, is dwindling. In this position of helplessness, some Republicans have sought a way regain control. Paul Ryan, the Republican Speaker of the House, has withheld his support for his party’s presumptive nominee to demonstrate to his colleagues that he too is discomforted by Trump’s platform and record. Rather, Ryan is forcing Trump to kiss the ring. Trump shrugged. Cruz has thus far refused to concede his delegates, seeking to use them to fight for a more conservative platform at the convention. Others have held their nose and endorsed the Trump campaign, many in the hopes that they may subsequently secure a high-level position in a possible Trump Administration, where they may steer the Republican Party back. Still, others would rather focus on preserving the party by dismissing the current election cycle, and focusing their attention on how the Grand Old Party may make a deal with the American people to postpone their inevitable demise: Next time, we’ll embrace Latinos. Next time, we’ll tweak the election rules again. Soon, we will enter the stage of depression. Many Republicans will slog through the remainder of 2016. Others will seek closure by creating some separation from politics. This may entail extended summer holidays or greater involvement in the lives of their families. Ultimately, the truths that produced Donald Trump’s meteoric rise since June 2015 will remain. In hindsight, there have been many symptoms: The Tea Party rebellion, Majority Leader Eric Cantor’s district loss, John Boehner’s exasperated resignation. On the contrary, Republicans will lose white working class voters (to abstention or revolt) if they continue to be tightly associated with Wall Street. But they will lose Wall Street (to moderate Democrats) if they seek to galvanize the white working class voters fueling Trump’s popularity. And the difference between Democrats and Republicans is that, thanks to demographic change and urbanization, the Democrats have calculated that they no longer need white working class voters to win. Comfort for Republicans will only come from acceptance. Change is coming. Featured Image Credit: Republican Party debate stage by Gage Skidmore. CC-BY-SA 2.0 via Flickr. Justin Gest is an Assistant Professor of Public Policy at George Mason University. 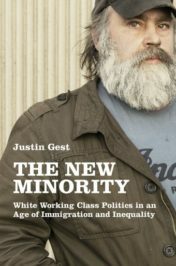 He is the author of The New Minority: White Working Class Politics in an Era of Immigration and Inequality. For more on the 2016 US presidential election discover Presidential Politics.